This is the season of caring. No matter your religion or belief, December is also considered a time to focus on the children we love. 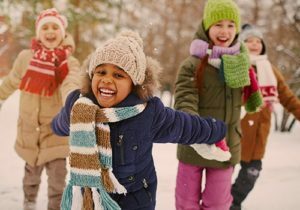 Whether we’re wrapping Santa’s gifts, buying Hanukkah treats, decorating the house in celebration of Kwanzaa, or volunteering for a toy drive, children add joy to the holiday season. And we at Social Security definitely know a thing or two about helping children. Often overlooked in the paperwork that prospective parents fill out in preparation for a child’s birth is an application for a Social Security number and card. Typically, the hospital will ask if you want to apply for a Social Security number for your newborn as part of the birth registration process. This is the easiest and fastest way to apply. The Social Security card typically arrives about a week to ten days after that little bundle of joy! You can learn about Social Security numbers for children by reading our publication, Social Security Numbers for Children, available at www.socialsecurity.gov/pubs. Remember, a child age 12 or older requesting an original Social Security number must appear in person for the interview, even though a parent or guardian will sign the application on the child’s behalf. The child must not be working and earning more than $1,090 a month in 2015. (This amount usually changes every year.) If he or she is working and earning that much money, your child will not be eligible for benefits. This entry was posted in Disability, General and tagged birth registration, children, children's benefits, disabilities, Disability, newborn, social security card, Social Security Number, ssi, supplemental security income by Jim Borland, Assistant Deputy Commissioner, Communications. Bookmark the permalink. I hope you folks are still here for us and these kids! Unbelievable SSA….you can use the word Hanukkah but you can’t use the word Christmas. Christians are not celebrating Santa Claus…they are celebrating the birth of Jesus Christ. Maybe you didn’t know that? I hope our new President will be able to do something about this out of control federal government that is rabid about wiping out Christianity in the US!! I for one am celebrating Santa Claus. My Christian counterparts are welcome to celebrate Christmas. My Jewish friends celebrate Hanukkah, and I have friends that celebrate Kwanzaa as well!!!! The thing that makes America truly great is the wonderful mix of different faiths, beliefs, and backgrounds. Happy Holidays and Merry Christmas too!!! In case you were unaware Jesus was a Jew. He lived and died a Jew and was not born in December. I say Christmas all the time and people look at me as, if I should apologize to them. Thank you for this excellent information on Social Security Cards for Children. Some people believe that a Child does not need a Social Security Card until he/she is of working age. We Christians celebrate the birth of Christ, hence Christmas — that’s the holiday that shows on my calendar for Dec 25th. I’ve been following SSA blogs for awhile. You seem to go out of your way to acknowledge diversity and many other religious groups, but to the exclusion of Christianity. Thank you for being one of the many blessings America has given All of us, and has helped us survive. Keep up the demoractic legacy as pass it to our children. I get to wait 4 years to find out if I’m approved for ssd. I’m confused on the day and year we are on. I think I had 3 tia’s and a seizure today, I’m super dizzy and all alone. I was told I was out cold for many minutes. I really hope I don’t have another seizure alone because I’m in fear of cracking my skull. Just another year and a half of waiting and hoping to live. Elections have consequences. You may want less government, but through the miracle of magical thinking everyone else will get less government but you? No one, from Congress to the White House in either party are making rationale choices as to what government must do, where to beef up services and where to cut back. They all take the cowards way of cutting everything equally that is not defense. You keep voting for them, so you will get the rewards of your votes. The new savior, ooops I mean president, will further reduce hiring to one for every 3 lost. So that means if you are waiting a year and a half for a hearing because the ALJ numbers were already reduced, it is about to get a whole lot worse. Good luck with Making America Great Again. A good synopsis of the progress we’ve made the past 8 Years. Hiring 1 to replace 3 has never happened. What does happen is the diversion of human resources to those things that fit the current political narrative and not hiring those who could lower the hearing backlogs. Such is the way it’s been for years. No priority for the essentials, plenty of priority for pet projects. I am grateful that in this Christmas season we will soon have a new President that will truly represent all of us Americans! We now will soon have the opportunity to be united in purpose, strong in dedication to becoming the best that we can be as Americans, and show our ability to be caring and respectful of others. We are certainly fortunate blessed by the Creator for our life, liberty, and the pursuit of happiness. Welcome President Trump; America needs you!! Some people will believe anything! Marcel Trump isn’t thinking about you unless you’re a millionaire. I opened this to comment on your omission of CHRISTMAS in your comments, but see that others have done that. Respecting the diversity of our country may be understandable, but not even mentioning or acknowledging the reason for the holiday is offensive. You may not be Christian, but intentionally avoiding even the name is sick, misguided Political Correctness. Oh, stuff it, Fischer. As soon as Trump gets into office, the Republicans will gut Social Security with H.R. 6489, introduced earlier this month. The bill will raise the retirement age and Social Security benefits for fossils like myself will be cut by 35%. So who gives a damn if you’re “offended” by something that isn’t offensive. Stick to real-life demons. For example, the Social Security Reform Act of 2016 I’ve just mentioned. Reread what you have just written; there is zero chance of a cut in SSA benefits for those who are receiving them. Allowing active wage earners to opt out and into a blended retirement plan is possible, but not probable. You are using the same old fear tactics that the left promotes and thrives on. Seems as though the scare tactics are coming from the right as usual. Get it straight Marcel. Ridiculous to blame Obama for this oversight. 😂If you are waiting for the president elect Trumps to correct this, big surprise is around the corne. He and his cronies are waiting to rid social security through their privatetizion plan. Yes he was making fun out of people with disability …. the people he picked are the ones who dont what the programs ssi and ssd … this just my thought. . I am so worried i dont if just start being homeless because this take place … regardless how we all feel. They dont care about us they got money and they will be ok and so will there families. I dont understand alot wat going with ssi and ssd but i am scared … in 2017 but was reading online that they were going to cut people off starting sometime in April. . I am so worried that be homless no were to go … i called ssi office they told me they cant talk about it ….. this scarie cause leave people like us who are on trying to get it left out to dry …. i even tryed to open my account ss site and would let me … so i can see if there change or that … i am worried sick ..
Hi Jean. Currently, there have been no changes to the Social Security programs. According to the Social Security Board of Trustees, the combined assets of the Social Security trust funds are projected to be depleted in 2034. If Congress does not act before then, there will only be sufficient income coming in to pay 79 percent of scheduled benefits. For more information, please visit https://www.ssa.gov/OACT/TR/2016/index.html. We hope this information helps. The SSA better get ready for the massive amount of SSI and SSDI applications coming next year when the States tries to keep poor single adult on Medicaid after the Republicans repeal Obamacare. New York and other States will restart the Disability Advocate Services to get people back on Medicaid costing the SSA billions of dollars. I seen parents drag their lazy kids who are over 18 years old to the local Social Security office to apply for SSI. The parents income doesn’t matter after they turn 18. They get free money each month and free college tuition when on SSI. It is better than a scholarship. All they need is to visit the psychologist/psychiatrist a few times complaining of anxiety, depression, hearing voice, seeing thing, low IQ, or mood disorder to get that free SSI. My daughter is an adult but she also has mental disabilities. She cannot leave her apartment or walk through the threshold. She can’t go outside of her house to check her mail. Neither can she throw her trash away. She hears voices who demand what she can or cannot do for her daily activities. I don’t know what to do to help her except pay her rent and help her buy her food once a week. She also won’t open her door for anyone. Can you please tell me if I can assign my social security income to my daughter in the event of my death? Hi, Pauline. We are sorry to hear about your daughter’s condition. An adult who became disabled before age 22 may be able to receive benefits on a deceased parent’s record. See “Adults Disabled Before Age 22.” In addition to that information, keep in mind that we pay disability benefits to people who are unable to work because of a medical condition that is expected to last one year or more or to end in death. If you think that your daughter is disabled and meets our definition of disability, we encourage you to help her apply for disability benefits. Please call our toll free number at 1-800-772-1213 and ask a representative to assist you. Representatives are available Monday through Friday, from 7 a.m. to 7 p.m. Or you can contact your local Social Security office directly. For more information visit our “Frequently Asked Questions” web page on disability. Thank you. My grandson is 5 and does not talk, walk, or feed himself. He does however get disability but does not have a diagnosis yet. His mom works and he has 1 sister with another sister on the way. My question is…she has been receiving disability for him but received a letter today stating he won’t be receiving a check in March due to the fact that they ESTIMATED her pay to a certain amount. Which is way over then what she makes.. How can you ESTIMATE pay when it is the same almost every month? Please someone explain and help me understand so I can calm my daughter down and wants to stop his disability. We wish we could help Jodi, but for security reasons we do not have access to personal records in this blog. Your daughter should contact her local Social Security office as soon as possible, she should bring and provide copies of her most recent pay stubs. If she is unable to visit the local office, she can call our toll-free number at 1-800-772-1213 for assistance. Representatives are available between 7 a.m. and 7 p.m., Monday through Friday but you will generally have a shorter wait time if you call later in the day or later in the week. Thanks. I read this post properly and my first thought is wow its great and I hope its a great opportunity for kids. I suggest to you that you carry on working for children . Nice post. Great for all user. AS a regular visitor i am here with something new for you. Every people loves a comfortable journey. To make journey comfortable we get some product. By Clicking Here you can get this also. Every child need hard security with freedom. So every parents need to look after their children with a good security. Then Children will be able to grow easily and then they will be save.